A map of all the metabolic processes in an animal cell. 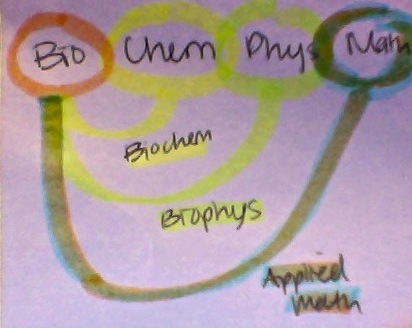 Essentially everything you need to know about Biochemistry. No problem, right? Instead of further investigating into things we don't understand, we tend to veer away from them. This was certainly the case for me when I first heard the term "biochemistry". The term "biochemistry" was once as foreign to me as the atomic element Mendelevium (Md). When I first started in science, I only thought of Biology (the study of life). Biology is all around around us. We ourselves, too, are Biology. This term made sense to me. All facets of science are integrated and essential parts of Biology. Okay, now what? Why should I care? How does this pertain to ME? Well, what do you do in an average day? And that's just in 5 minutes of your average day! In case you're still unconvinced, check out this short clip on cellular respiration (Khan Academy) . The thousands and millions of cells that we are composed of, allowing us to survive, do this multiple times every minute!! On the one hand, scientists need to do a better job explaining science. Especially when it comes to subjects such as "scientific jargon". However, it's just as much our responsibility to take interest into learning what a word (or collection of words) means instead of automatically dismissing it as "too complicated" or "difficult to understand". Science is easy if you just spend a little time getting to know it. It's like that really quiet friend you're never sure about - do they love you or hate your guts?? After a few conversations and maybe some Star Trek, you come to realize they're actually super cool and friendly! Science is that friend. Neurohormones - what are they? Why are they interesting and how do they play into the field of Biochemistry?